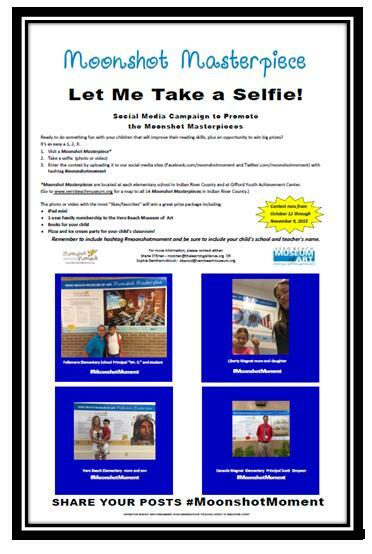 Beginning on October 12, the Moonshot Moment Outreach Team will launch a 4-week social media campaign inviting people to visit the Moonshot Museum Masterpieces located at the Gifford Youth Achievement Center and in the 13 elementary schools in Indian River County. The idea is to get as many people as possible to visit and view one or more of the Moonshot Masterpieces with a purpose of raising awareness for the Moonshot Moment. Participants enter the contest by posting a selfie/video to Facebook or tweeting one out using Twitter, and the intended outcome is a measurable audience who have been engaged in/energized by this activity. The contest participant should visit one of the Moonshot Masterpieces, and then upload a selfie or video to either Facebook.com/moonshotmoment or to Twitter.com/moonshotmoment. They must include their school and teacher’s name, as well as the hashtag #moonshotmoment, to be eligible to win. On November 10, we will tally up the video or photo that has the most “likes/favorites” and that person will win a prize package that includes a mini iPad, a free one-year admission to the Vero Beach Museum of Art, and a set of books that match the masterpiece activities. The teacher tied to that winner will receive a free"pizza and ice cream" day for their class. The Vero Beach Museum of Art is the largest cultural arts facility of its kind on Florida’s Treasure Coast featuring five art galleries, two sculpture parks, Museum Art School, state-of-the-art auditorium, Museum Store and Café. The Museum offers changing exhibitions of world-class art, group tours, daily activities to engage families, art based events and FREE admission Saturdays on the last Saturday of each month. The Museum is open year round. Check out the website www.verobeachmuseum.org for current exhibition and event information. In 2012, Dr. Fran Adams, the former Superintendent of the School District of Indian River County in collaboration with The Learning Alliance launched the “Moonshot Moment: 90% Literacy by Third Grade in 2018,” making it one of the 140 communities working with the Campaign for Grade Level Reading (CGLR,) a nationwide movement of local leaders, states, nonprofits, and foundations putting a stake in the ground on third-grade reading. The communities are adopting a collective impact strategy, engaging the full community around the goal of supporting low-income children from birth through third grade. Acknowledging that schools alone cannot address all the challenges that keep children from learning to read, the School District of Indian River County works with nonprofits and other partners to ensure that children arrive at kindergarten ready to succeed, attend school regularly, and keep learning through the summer months. The Indian River County Moonshot Moment Literacy Leaders group is comprised of over 70 business, nonprofit, and School District leaders along with many concerned citizens, working together to create programs and momentum to reach the 90% literacy goal! For more information, contact Marie O'Brien - 877-548-READ (7323) or Sophie Bentham-Wood, 772-231-0707.